How to cook zucchini noodles- showing you an easy 5-minute method for cooking zucchini noodles, plus how to make them ahead and store for meal prep. Vegetable noodles are one of my favorite ways to introduce new vegetable textures into recipes, and zucchini noodles are one of my favorites for many reason. 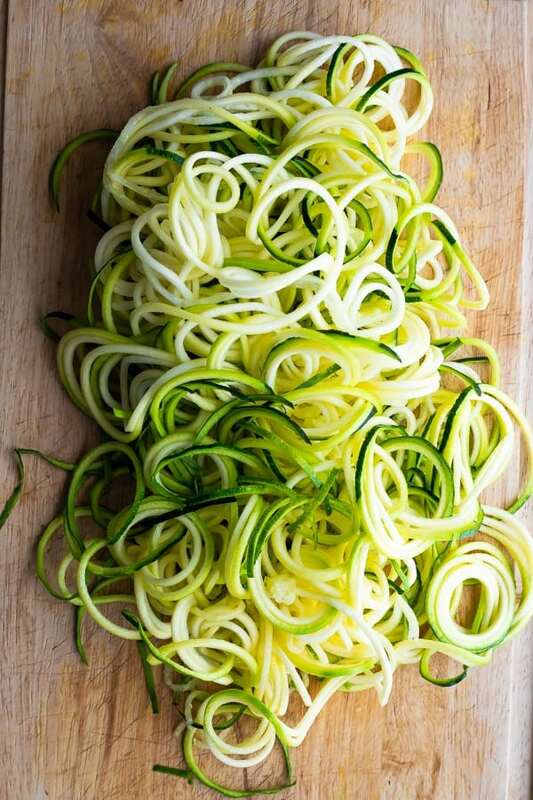 Not only are zucchinis pretty easy to spiralize but zucchini noodles are surprisingly similar to pasta in texture. We like mixing zucchini noodles in 50/50 with whole wheat spaghetti and it is a great way to ‘sneak’ extra veggies in without really noticing. 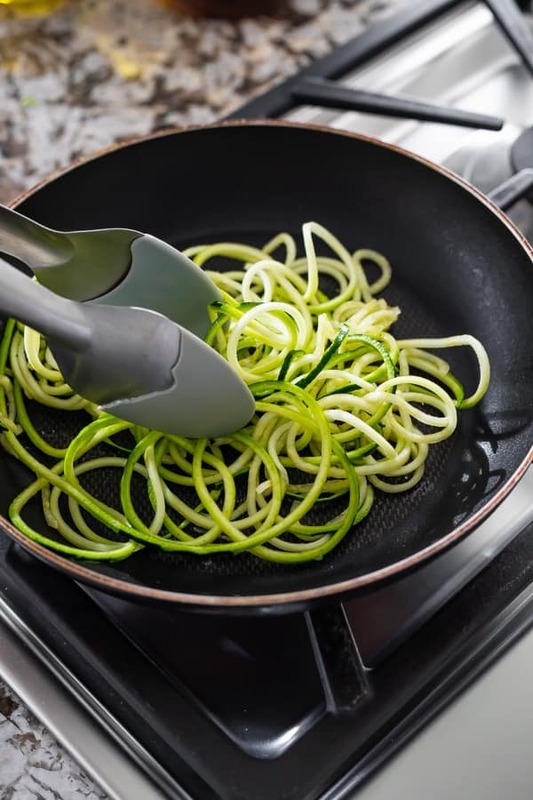 Today we are talking how to cook zucchini noodles, plus how to make them ahead and store for meal prep! 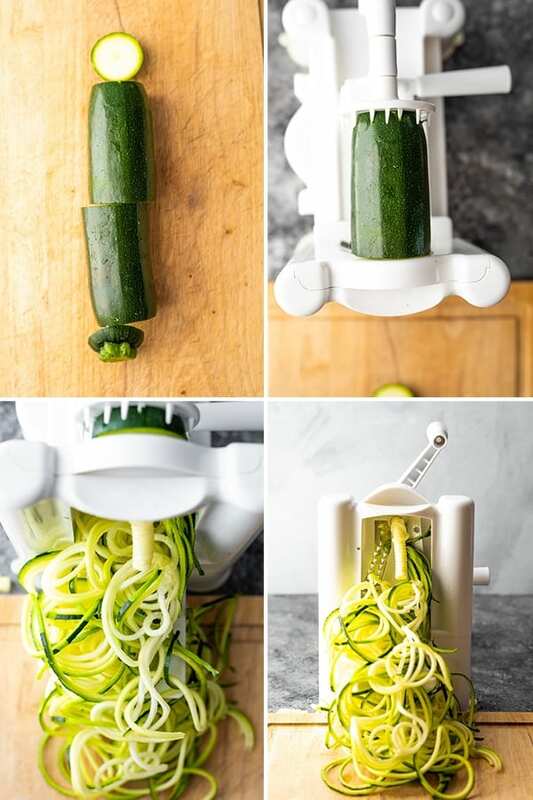 In order to make zucchini noodles, you will need a sprializer. These days there are plenty of spiralizers on the market, including cheaper hand-held models! as well, though I haven’t tried. 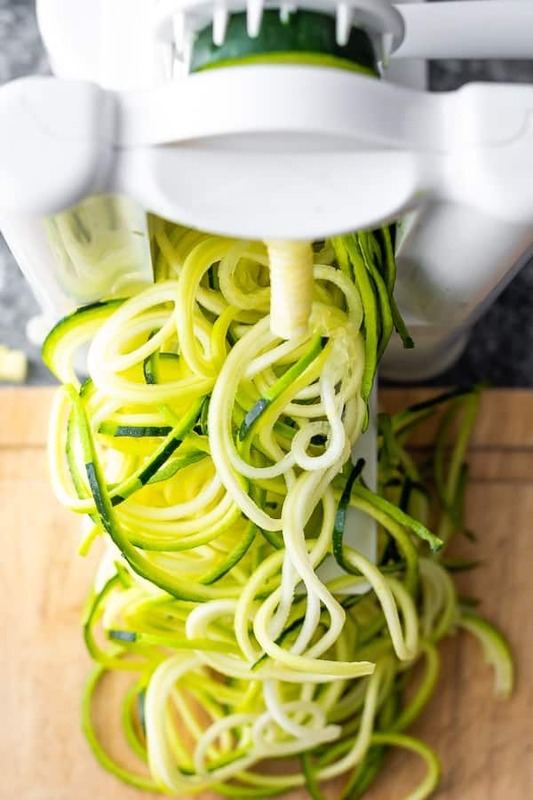 If you find you are creating ‘half moons’ rather than long zucchini strands, you might wish to reposition the zucchini on the spiralizer. Cooking zucchini noodles is so simple, and all it takes is a couple of minutes. You can also cook zucchini noodles right in a pasta sauce. 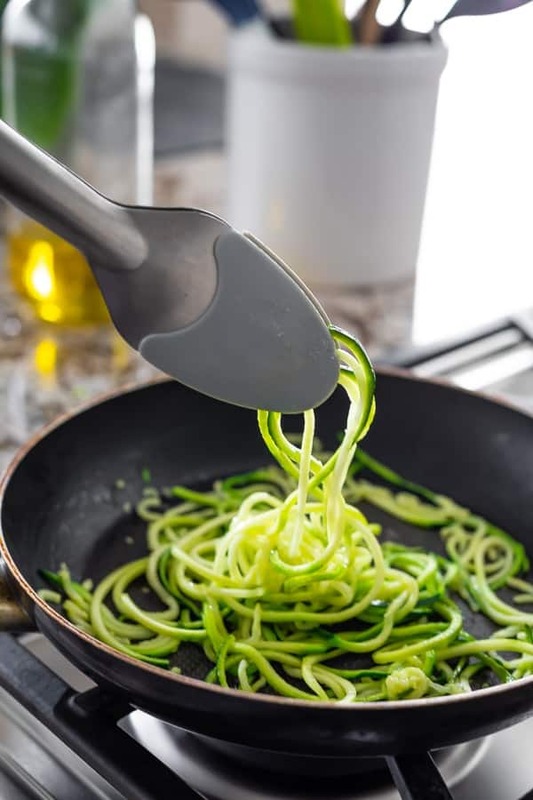 Once your sauce is hot and ready to serve, add the zucchini noodles and heat for 2-3 minutes, stirring gently with tongs. You can absolutely use zucchini noodles for meal prep, though there are a few ‘rules’. 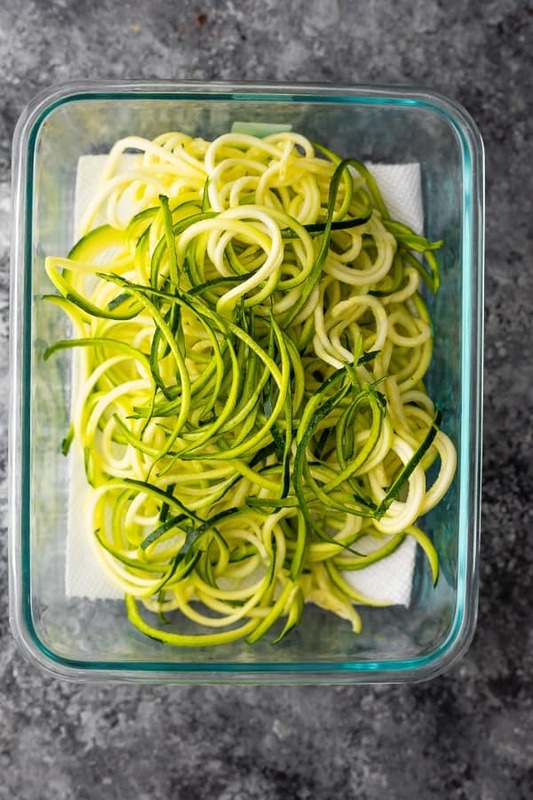 Pre-spiralized: You can pre-spiralize zucchini noodles and store in the fridge for up to 4 days. I like to store on a paper towel, which absorbs extra moisture and keeps them from getting slimy. 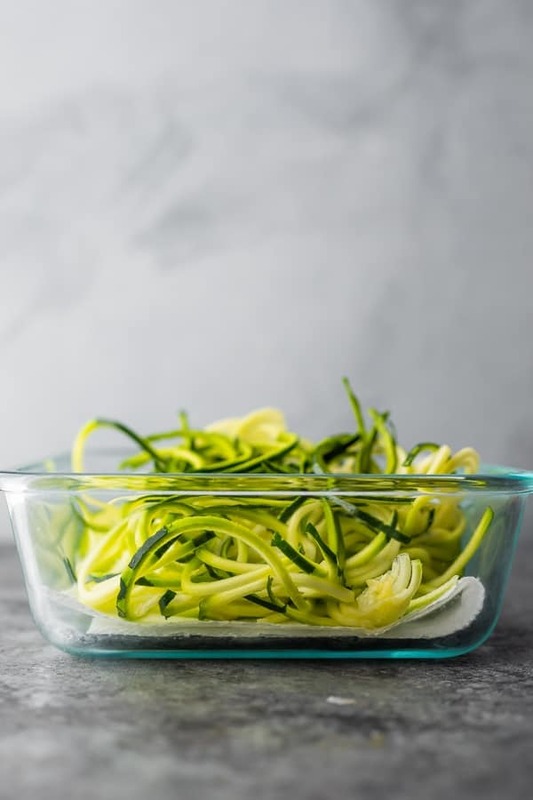 Meal prep bowls: When using spiralized zucchini in meal prep bowls, do not cook, and store separately from a sauce if possible. When re-warming in the microwave, the zucchini noodles will cook through. Freezer: zucchini noodles cannot be frozen. They get mushy and gross. Pick straight zucchini that are at least 2 inches thick. Trim the ends off as straight as possible. You may wish to cut each zucchini in half across the center, to make two shorter pieces. Use the small (1/8 inch) blade on your spiralizer. Attach one end of the zucchini to the rotating paddle, and center the middle of the opposite end of the zucchini on the circular blade. Rotate the handle with gentle pressure to generate zucchini noodles. 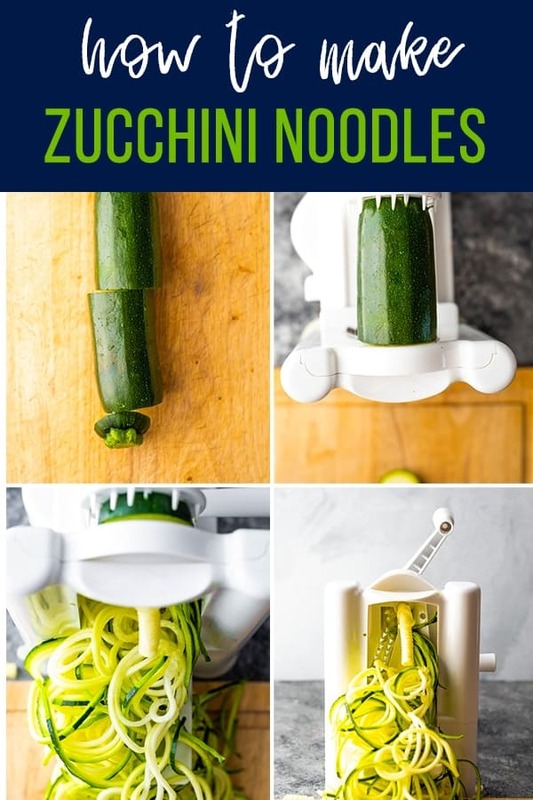 If you are getting many short 'half moon' noodles, remove the zucchini and re-center it on the blade. Heat olive oil in a nonstick skillet over medium heat. Add the noodles and cook, stirring and tossing with tongs, until slightly tender, around 2-3 minutes. Zucchini noodles may be stored (pre-cooking) in a storage container lined with a paper towel for up to 4 days. Hi Dallas, what a GREAT idea! I never even thought of that, but now I hope to try it. I am really crossing my fingers that I have an overproducing garden this summer!